Harlem rapper A$AP Rocky member of the hip-hop collective A$AP Mob opened the show for the pop princess Rihanna. The stage was set with a MC, and a three-piece band. A large white throne like chair was sitting in the middle of the darken stage. 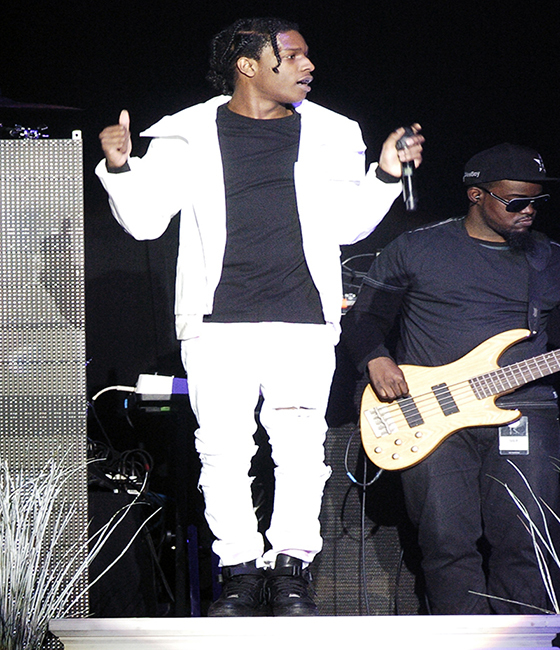 A$AP Rocky bounding onto the stage clad in all white attire. The brand name Pyrex was visible on his white boxers. A$AP smile at the crowd and his gold grilled glisten onstage. A$AP Rocky sat on his throne at times or bounced around the stage all the while spitting out lyrics to “Hands On The Wheels”, “Wild For The Night” and “F…Problems” which had the Baltimore crowd partying like they were at the club.